QuickStart Tennis balls from Oncourt Offcourt have a new look. The buckets have been redesigned with bright bold colors, making them better than ever to use as court targets. Plus, the lids are now hinged for easier ball access and storage. Three ball speeds with designated colors are available as part of the USTA QuickStart Tennis initiative. The Oncourt Offcourt balls meet USTA specifications in size, weight, color, and rebound. 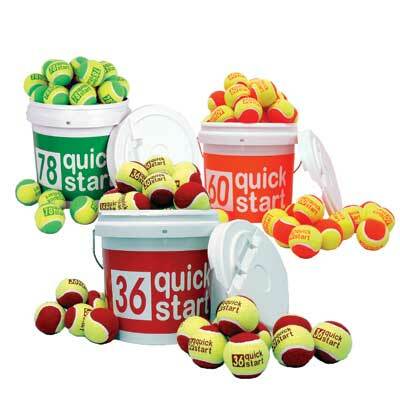 The Quick Start 36, Quick Start 60, and Quick Start 78 felt balls each come in two bucket sizes to help teaching pros, coaches, and parents keep the balls organized and separate from other practice balls. For information on these products and to receive a free color catalog, contact Oncourt Offcourt toll-free in the United States at 1-88-TENNIS-11 or visit oncourtoffcourt.com.